Fall = pumpkin spice everything. Yet here I am, only November 11th, and I am slightly done with it. So with that said, this may in fact be the last pumpkin related post of the year. In fact, it may be my only pumpkin related post. Sometimes I just want a little taste of pumpkin without having to buy an entire pumpkin pie or going to Starbucks to buy a $5+ pumpkin spice latte. This recipe solves all of those problems. Best of all? There are only 4 ingredients and it only takes 60-seconds to make. Why can't ever recipe this simple? Mix and bake. Not even bake, microwave! That's right, you microwave this dessert rather than baking it in the oven. Top the cake off with a little whipped cream and cinnamon and you've got the perfect dessert or after school snack. A special thanks to The Gunny Sack for coming up with this fool-proof recipe. Tasty and easy, can't get much better than that. 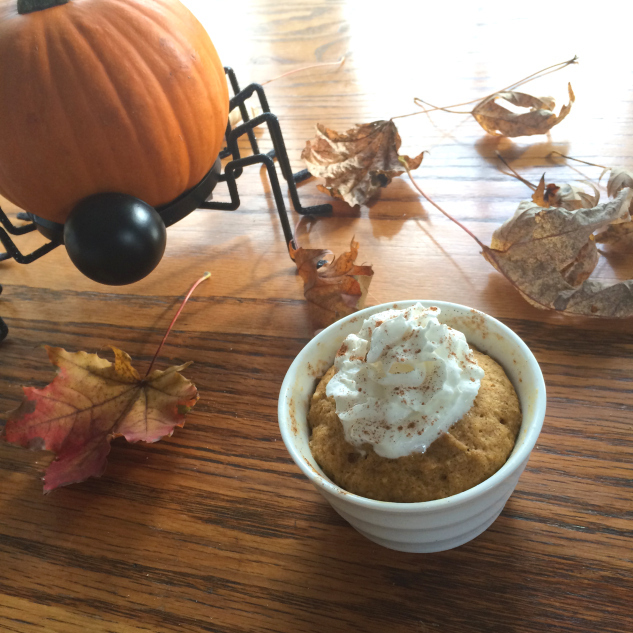 Put 3 tablespoons of cake mix (regular or sugar-free), 1 tablespoon pumpkin puree, 1/2 tsp pumpkin pie spice and 1 tablespoon water into a small greased, microwave safe bowl or mug. Mix with a fork until mostly smooth.